Owning the action on the pitch? "Some people believe football is a matter of life and death. I am disappointed by this attitude. I can assure you it’s much much more important than that." (Bill Shankly, former Liverpool manager). The influx of foreign football stars showcasing their skills in China have undoubtedly increased the profile of the Chinese Super League. The true impact of the surge in media attention for the Chinese Super League remains to be seen but football is big business and more than ever a global business. For the participants in the market (principally players, clubs, leagues and governing bodies – collectively “the participants”), it is equally true that brand protection has never been as important as it is now. For the industry to thrive, the participants must ensure that the game’s value can be controlled and exploited, and a key element of this is the effective protection of intellectual property rights (IPRs) that inform, enhance and identify the brands that they represent on and off the field of play. Manchester United are a prime example. 2015 saw them reclaim the title of most valuable football brand on the planet at $1.2bn, largely due to a 10 year kit sponsorship deal with Adidas worth £75 million a year. According to KPMG’s European Elite football club valuation rankings Manchester United again topped the 2016 financial league table along with Real Madrid with an estimated worth of £2.2 Billion, testament to the strength of the club’s brand and global appeal. United were the first English team to register a trade mark back in 1970 (although interestingly they were pipped by both Rangers and Celtic north of the border). So, while they have struggled and faced criticism for their performances on the pitch (including from their own sponsors), their continued commercial success illustrates the importance of brand value and brand protection. As the 2016-17 season plays out United will almost hope that their performances on the pitch can mirror to some extent the strength of their commercial partnerships off the pitch. A win in the 2017 Football League Cup Final certainly puts them on the right track but no doubt they will be hungry for more success on a bigger stage. It is well-known in English law that “a sporting spectacle cannot be owned in any ordinary sense of the word”, so the right to use the trade marks and IPRs associated with these events and their participants is a large part of what a sponsor or broadcaster is paying for. Likewise, when a footballer or club is commercialising the products or services they put their name to, the legal protection enshrining the right to use their name or brand is what differentiates an official offering from an unofficial offering. In that respect, the success of a trade mark rests in the hands of the parties controlling how it is used. Registration is often seen as an important step in developing a brand, as it sends a clear message to consumers by unmistakably identifying the origin of the products bearing the mark. However this is just the start of an official process of telling the world that this mark belongs to you in relation to specified goods or services. Clear ownership and control over the marks that a rights holder purports to own also offers security and comfort to potential partners who wish to engage in activation of the rights they wish to associate themselves with. The perils of misusing trade marks or failing to protect the rights that a party seeks to rely on often only surface when it is too late to avoid a mishap. For example, 2015 witnessed the most successful football team in Romania, Steaua Bucharest, struggle to maintain their identity. In 2014, the team temporarily lost not just their name but also rights to play in their club colours and club crest in a dispute with the country’s defence ministry. The dispute saw them even play one game as the “Champions of Romania” with the team appearing as “hosts” on the scoreboard. The dispute occurred because of a disconnection between ownership of, and permission to use, the trade marks and names identifying the club. After the revolution in Romania in 1989, the club was separated from the Army and became privately owned but was allowed to continue with traditional branding with the permission of army. When it was bought by a local businessman in 2004, the Army no longer wanted the club to use the “Steaua” name and brand, which ultimately led to a lawsuit. The club is reportedly very close to an agreement regarding the intellectual property rights (IPRs); but losing a name or even the threat of losing a name can be a difficult experience for fans to accept. When a club is steeped in history and prestige, changing a name, or even losing the rights to use a name or logo associated with the club, can impact on the values that are associated with that brand. A change of name or club badge/crest that comes by design can cause just as much upset amongst fans who see their allegiance to a club enshrined within the clubs history. That is exactly what Juventus known, affectionately, as the “Old Lady” risked upon unveiling a new club logo in January 2017. The club’s president, Andrea Agnelli, declared that the logo, which was designed over the course of a year, was a ‘symbol of the Juventus way of living’. The response on social media in the aftermath suggested fans were less keen on the updated look for the “Old Lady” of football. While the new logo is arguably recognisable as part of the Juventus brand the new-look logo is also undoubtedly a departure from the previous badge and therefore significantly different to the logo reflected and protected in many existing trade mark registrations. It follows therefore that while it is likely that the club would maintain registrations for its classic badge, adopting a new logo to represent the brand can bring with it brand protection problems without appropriate measures in place. For a club with an international appeal it can also prove costly filing trade mark protection for new logos in multiple product/services categories. Recognition of a clubs’ logo as a famous mark or a mark of repute will not automatically transfer reputation to a newly adopted logo – and this is something worth considering alongside a strategy for making sure a new club crest is protected not just in jurisdictions of interest but also with relevant customs authorities who might well decide that a new badge is not covered by an earlier customs recordal covering the old badge on merchandise. Change is not necessarily a bad thing although it is not always welcomed with open arms but a rebrand can impact on the values that are associated with a brand and without strategic planning can leave holes in the armoury of IP rights a club can rely upon to protect their rights. Another good example of potential problems awaiting football clubs seeking to register rights is the first to file regime as was the case with Valencia CF, who have reportedly been jousting with DC Comics over the use of their bat logo. The New York based publisher, who owns the trade mark shown below, has objected at the European Union Intellectual Property Office to Valencia’s attempts to register their new “bat crest” (shown here), claiming the logo is too close to two of its own images related to the caped crusader, Batman. This is an important reminder that adopted signs, emblems, mascots and nicknames might mean different things to different consumers. The changing commercial landscape in football has meant that the beautiful game is no longer just about the game of football. Commercial Opportunities present themselves across a diverse range of business sectors and therefore protecting a club’s Intellectual Property Rights now entails more than looking at those goods/services traditionally associated with football. In terms of the scope of trade mark protection a rights holder might want to protect, increasingly, Applicants from the world of football will protect their core trade marks in respect of a wide range of goods and services. Delving into new partner categories or business sectors means an increased chance of encountering prior rights on the Register or the wrath of rights holders eager to protect any encroachment on their rights. AC Milan found themselves pitched against an unusual opponent following a recent filing for their revised logo at the EUIPO which met with opposition from Marriott Worldwide Corporation owner of the mark AC HOTELS MARRIOTT. Unsurprisingly, given the minimal role played by the term “AC” in the filing made by the football club the opposition failed given that the marks were deemed sufficiently dissimilar so as to be able to peacefully co-exist on the Register. AC Milan’s logo filed under EUTM Application No.1182615, and shown below alongside the opponents mark, covered numerous goods/services (16 different classes in total) including “hotel services” in class 43 – perhaps a category that would not have been deemed important to the club only a few years ago. In today’s commercial environment partnerships with hotels or even hotels attached to a football stadium are commonplace and indicative of the wider commercial interests that appeal to football clubs. This diverse business portfolio makes it more likely that a club will be looking to protect logos and other IP in respect of goods and services in non-traditional business sectors which could see them clash on a more regular basis with more unusual opponents off the field of play. It should be highlighted that AC Milan are not in the clear just yet as the latest record available on the EUIPO Website for this application suggest the Opponent has appealed the decision to reject its opposition. This match could be set for a replay at some point in the near future. Away from their considerable successes on the pitch, at the end of 2014 FC Barcelona lost a domain name dispute against a Bayern Munich fan over a second level domain in the new dot Email gTLD, namely the domain “FCB.email”. The cybersquatting dispute was decided in favour of the Bayern Munich fan who registered the domain name to provide email services for Bayern Munich fans. The case was of interest as one of only a relatively small number of cases utilising the Uniform Rapid Suspension System (URS). On the facts, FC Barcelona were unable to substantiate a “clear and convincing” case of cybersquatting as required by the Uniform Rapid Suspension Policy. And while they could point to a valid figurative Community trademark for “FCB”, it did not follow they owned any word trade mark consisting solely of the acronym, such that the disputed domain name could be considered identical or confusingly similar to the club’s trade mark. Resisting the temptation to call it a “Messi” situation, one could consider the need for clubs to be circumspect in what they think they own and how they go about enforcing their rights. In contrast, utilising the Uniform Domain-Name Dispute-Resolution Policy (UDRP) at the World Intellectual Property Organisation (WIPO), the English Premier League (EPL) managed to win back the secondary domain premierleague.club, which was facilitating a website mimicking the EPL’s official address. In this instance, the EPL was able to successfully prove that the Respondent had registered the disputed domain name in bad faith with the intent of trading off of the goodwill of the Complainant’s mark. The case serves as a helpful reminder of the bad faith elements that are considered in UDPR cases. 12 months on from “.Email”, and 2015 ended with another defeat, albeit a rare one, for FC Barcelona in their continued efforts to strengthen and enforce their IP Rights. The EU General Court upheld a refusal of Barcelona Football Club’s application to register as a Community Trade Mark the outline 7-pointed shape of its crest, which appears on players’ shirts. The Court found that the shape (which did not include the FCB letters or the emblems which adorn the crest) had no striking features and would simply be seen as a decorative shape rather than as a badge of origin associated with the Spanish Giants, so essentially the crest did not fulfil the function of a trade mark. Rangers have the honour of being the first club in the UK to enjoy registered trade mark protection. Recently however they found themselves having to assure fans that they are still in control of the club’s “badges”. This followed claims that the Newcastle United owner, Mike Ashley, had acquired the rights to various trademarks. In reality, as part of a £5mn loan deal, Sports Direct took security over all of Rangers’ assets – aside from Ibrox – including the club’s intellectual property rights. The Intellectual Property Office (IPO) site confirms the transfer from Rangers Football Club Ltd to Sports Direct was fully assigned on 25th March 2015. This is a reminder for fans that history and provenance don’t always govern what happens to a team’s name and badges. Trade marks, design rights and copyright are IP assets and can be traded as such, and it does not always follow that when a fan buys merchandise to support their club that the money they pay is going to their club. It may seem odd but it might be that funds from the sale of one club shirt go towards buying a player for an entirely different club. Rangers’ fans might not be happy but it does illustrate the role that trade marks can play in terms of securing investment and/or credit to businesses in need of cash injection. The ongoing saga over control of the Rangers name, trade marks crests and badges continued throughout 2016 and indeed full time has yet to be called in the dispute as Rangers served notice terminating an agreement with Rangers Retail, controlled by Mike Ashley, withdrawing the rights to use the clubs Intellectual Property (and in particular trade marks) on merchandise prompting Ashley to lodge a complaint with the Chancery Division of the High Court of Justice to regain licensing rights to the IPR’s that essential facilitate merchandising of club branded memorabilia. As this dispute spills over into time added on it once again serves to highlight the importance of the role played by trade marks in supporting the commercial activities of a club. Rangers might find themselves in trouble over their use of the club badge, which could fall foul of Scottish Heraldic law governing the use of shields with certain symbols in such as crowns, lions or a saltire. Rangers are one of a number of clubs alongside Hibernian and Dundee United who face a battle with the Court of the Lord Lyon - the heraldic authority for Scotland - which has the power to prosecute anyone who uses coats of arms without authorisation. Ayr United have already launched a campaign calling on fans to help design a new club badge after the current crest was declared to break heraldic law following a complaint from a member of the public (I am guessing not a fan), which led to the Procurator Fiscal for the Court of the Lord Lyon ruling that the emblem contravenes ancient rules. Another club, Airdrieonians, had already changed their badge for the same reason. This situation seems bizarre but is a reminder that local and international laws can offer protection to particular symbols and to certain terminology, and the adoption of club crests might not always be registrable in the territories where a registration might be of most use. Football reports and commentary often refer to a player’s “trademark free kick” or “trademark turn or tackle”. This inevitably conjures up images of the relevant player executing their particular skill. This is just a clichéd description to add flavour to the action – IPRs will not protect a player’s skills on the field of play. Footballers have however sought to protect other distinctive identifiers that they claim are capable of indicating origin in a true trade mark sense. When Gareth Bale recently registered a logo featuring the heart-shaped hand gesture that he performs after scoring a goal it caught the attention of more than just the traditional sports media. However Bale’s celebration, the “Eleven of Hearts”, as it has been referred to, was far from a trailblazing registration. In truth, Bale was simply following in the footsteps of many footballers before him who are brands in their own right. Protecting names, signatures, likeness and celebrations (or indeed a silhouetted outline of a free kick stance as logos) are par for the course these days. It merely reinforces the widespread commercial appeal that today’s sporting stars embody whether that be as brand ambassadors or marketable products in their own rights. Brand Beckham is perhaps the perfect example of this. 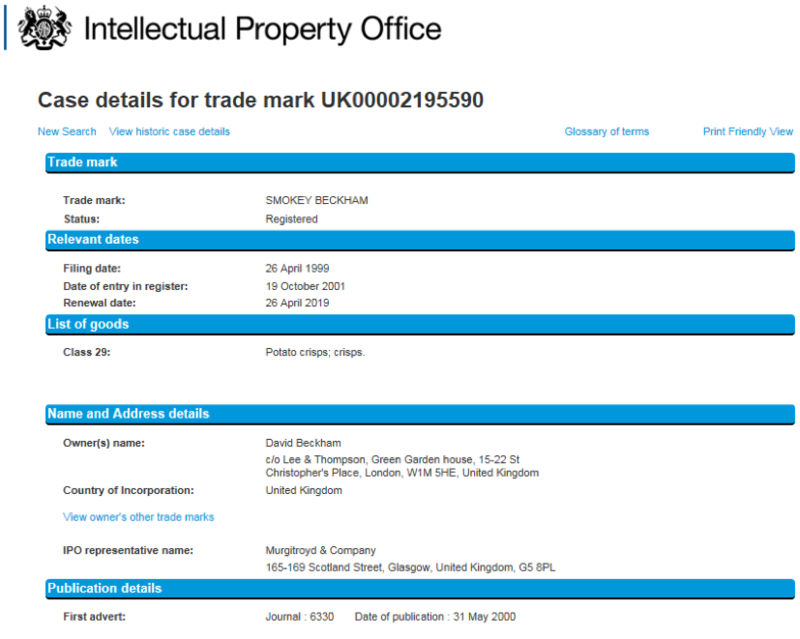 In addition to an array of trade mark registrations for marks such as DB07, DB23, BECKHAM, the Beckham free kick logo, Gary Lineker (the long time face of Walkers Crisps) might be alarmed to find out that Brand Beckham has long since owned a registration for SMOKEY BECKHAM, covering potato crisps as far back as 1999. Exploring trade marks owned by individual footballers a little further one can see that some players are much better educated or prepared when it comes to controlling their personal IP rights than others. Research undertaken in Summer 2016 suggested that FC Barcelona, AC Milan and Manchester United topped the list of leading trade mark filers in the football world. When it comes to players Barcelona enjoy a prolific hat-trick of trade mark connoisseurs with Neymar, Iniesta and Messi all leading the way with sizable portfolios. Neymar tops the charts with a reported 50 trade mark registrations. However while some players like to whine on the pitch, Neymar’s team mate Iniesta likes to make wine off the pitch and has put his name and face behind a wine business protected by numerous trade marks protecting the Iniesta brand which goes some way to explain the interesting array of filings owned by Iniesta. Not quite brand Beckham but on the way. With an increasing number of players promoting themselves off the pitch in order to leverage their popularity on the pitch it is likely that the number of players owning and expanding their personal trade mark portfolio will see a huge upturn. The increasing popularity of football in China and the USA is only likely to make strategic trade mark filings an important part of future endorsement deals or personal commercial ventures whether it be a personal fashion label or a record label. Players sporting the own personal logos have quickly realised they can add another string to their commercial armoury and build a brand linked to their skills on the pitch which endures off the pitch. A good example of this can be seen from @paulpogba https://twitter.com/paulpogba and his various commercial activities. 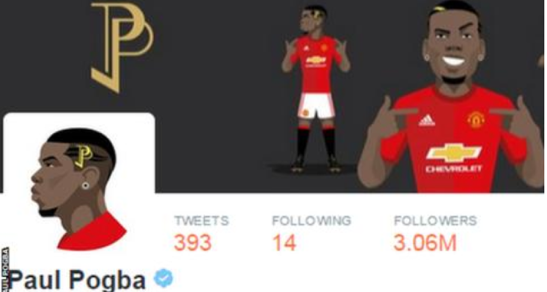 Pogba launched his own emoji ahead of United’s home clash with Liverpoolin January 2017 and owns several trade marks including national French Registrations, International Registrations and European Trade marks for “Paul Pogba”, “PP06”, “Pogboom06” & his signature. It’s surely just a matter of time before he adds to his collection of marks and perhaps next on his wishlist will be his “PP” motif. A description of a trade mark free kick is one thing. A trade mark registration for the silhouetted outline of a free kick striking position is another. Sport has come a long way. It should be noted, though, that whatever protection a trade mark registration affords a player in commerce for a particular stance (whether it be celebratory or before a set play), it will not allow a player to prevent other “players” from adopting a similar position on the field of play. On-field action and live sport as it plays out can thankfully be differentiated from commercial ownership of the IPRs associated with sport. There are no examples to date of set plays in rugby, hockey or football being banned due to some form of IPR protection. While Johnny Wilkinson might be able to trade mark a particular image of himself about to address the ball in respect of merchandising goods/services (CTM Registration No.003592458); trying to enforce this right to prevent a player from copying this on the field of play would be ludicrous. The 2015-2016 Season was a refreshingly unpredictable Premier League Season in England (unpredictable save for Arsenal’s annual capitulation as title contenders), with Leicester crowned Premier League Champions, and Chelsea, the reigning Champions, declared as “also rans” early on in the campaign. The “Special One” (Jose Mourino) lost a bit of his sparkle, and while the Premiership was a duller place without Mr Mourino (his absence was short lived following his move to Manchester over the Summer) the appointment of Jurgen Klopp at Liverpool might provide equal entertainment. Mr Klopp, the self- professed “Normal One” has a trade mark application pending (now registered) to protect the nickname he has acquired on his first appointment to the EPL, filed by the club he manages. Incidentally “The Special One” also enjoys Trade Mark protection as a CTM (now European Trade Mark) and is registered to a Portuguese entity. Interestingly, as identified prior to his move to his new club, Manchester United, Jose Mourinho’s signature and name are registered trade marks belonging to Chelsea Football Club. Time will tell if these get transferred (they are currently still under ownership of Chelsea) but it could certainly be one of the more unusual football transfers in the footballing world. It also raises some interesting questions concerning how IPRs are dealt with in player and manager contracts with their clients. A well advised player/manager would generally not cede control of their marks to a club which is free to transfer them at some point unless the remuneration for doing so was significant to counter balance the loss of control. No article on trade marks in football would be complete without a cursory nod to the case of Arsenal Football Club plc v Matthew Reed. Trade marks in football have come a long way since a decision in 2003 from the Court of Appeal in England which found that the sale of unofficial Arsenal Football Club merchandise by a street vendor amounted to trade mark infringement regardless of any warnings given to potential customers. The ruling might not have sounded unusual – a typical 1-0 win for the Arsenal; but at the time it was a significant relief to brand owners, particularly sports teams/clubs, which stood to lose significant sums of money in sponsorship and merchandise deals if the ruling went the other way. The case concerned a street vendor Matthew Reed (incidentally an Arsenal fan) who had sold unofficial Arsenal branded goods. Mr Reed had originally overcome the allegation of passing off in the High Court by claiming the use of the logos on the unofficial goods was merely “use as a badge of allegiance” and not trade mark use. The European Court disagreed and issued him a red card. The Court of Appeal also eventually agreed with the CJEU and held that the selling of unofficial merchandise was likely to damage the trade mark, or at least jeopardise the guarantee of ownership that stemmed from the trade mark thus leading to a finding of trade mark infringement. In other words the “guarantee of origin” function of the Arsenal trade-marks was affected. The dust has long since settled on this case but it is mentioned here as it demonstrates the importance of maintaining ownership and control over trade marks that identify a club and this is as true today as it was then whatever the goods for which protection is being claimed. It seems in football everyone wants a piece of the commercial pie, even when the pie is a pie itself. So goes the case in a recent trade mark dispute over the naming rights to the famous “Killie Pie”. The pie is sold at Kilmarnock FC by local caterers, Brownings Bakery. Brownings have applied to register a trade mark for the delicacy (named “Best Pie” in the Scottish Professional Football League last year). However, Kilmarnock FC own a trade mark for “Killie” covering pies and snacks. It would appear that there is no love lost between the managing Director of Brownings and Club Secretary at Kilmarnock and the partnership between the two is due to expire at the end of May. No doubt this meaty legal dispute over the best pie in the SPFL could leave a bad taste in the mouth. Speaking of pies, Sutton United’s impressive FA Cup run culminating in a defeat in the Fifth Round to Arsenal was somewhat overshadowed by its own Piegate scandal when reserve goalkeeper Chris Shaw tucked into a pie while standing by the Substitutes bench following news that one bookmaker was offering odds of 8-1 that Shaw would eat a pie on camera during the match. The bookmaker, Sun Bets, who also sponsored the team in a one-match deal may have got what was coming for mocking the 23-stone keeper’s stature (allegedly paying out at least one 5 figure sum) but Shaw has also ended up on the wrong side of the law for a potential breach of betting regulations. Shaw claimed the stunt was “a bit of fun” but has subsequently resigned his post with Sutton. His playing days with Sutton might be over but an endorsement deal as the face of one pie maker or another is surely not pie in the sky stuff and a sure sign that in football commercial opportunities present themselves whenever the action on and off the pitch makes headlines. From pies to pants and the 2016 European Championships provided sponsors once again with the opportunity to cash in on their official partnerships at a major football tournament. It also offered the usual opportunities for brands not officially associated with the tournament to promote their brands via a timely affinity with the beautiful game. Bendtner fell foul of UEFA rules on ambush marketing, which bans advertising on players’ kits, and Rule 4 of the FIFA Laws of the Game pertaining to the use of advertising and slogans on undergarments. Bendtner was hit with a ban and an £80,000 fine, duly paid by Paddy Power, who enjoyed significant additional exposure, proving ambush marketing can be highly effective, even when it involves pants. Against this backdrop perhaps the biggest challenge to the EURO 2016 official partnership programme came in the online space with social media sites witnessing an upsurge in their share of unofficial marketing campaigns. UEFA like FIFA would have experienced the changing face of ambush marketing around major sporting events. Tackling ambush marketing has perhaps become more about offering official partners something unique to activate their relationships with the Rights Holder, something that unofficial parties cannot get their hands on, while being circumspect about what official partners can expect the rights holder to do to combat attempts by third parties to ambush an event . As ever, the IPRs protecting the event, and its participants, will be key to any victory for brand owners. Brands are critical for creating business value, and the sports business and football in particular is no exception. Strong brands command customer loyalty and premium prices, constituting valuable assets that drive company revenue and growth. They are central to many sports business transactions, especially sponsorship deals and product merchandising. And at the heart of branding lie trade marks. Ultimately, the success of a trade mark rests in the hands of the parties controlling how it is used. The overriding message for trade mark owners, whether they are exploiting a club badge, team nickname, an individuals name or even a famous pie, is to look after your trade marks and your trade marks will look after the brand. Football is a game of two halves and registering a trade mark is only half the battle. The American Humorist, Arnold H. Glasow, once said “in life, as in football, you won’t go far unless you know where the goalposts are”. So being better prepared than any opponent and importantly knowing where the goalposts are will ensure more successes than failures both on and off the pitch.